Don’t let the headline of this post fool you. As a content marketing agency, we love blogs and we think most companies should have one. They’re a great way for brands to share interesting content and drive traffic to their website. But there’s a major game-changer in town for 2016. A platform so engaging that it’ll blow your blog out of the water. Join us as we take a look at what an interactive magazine can add to your marketing mix. One of the major benefits of an interactive magazine is that it allows you to create beautiful, mobile responsive designs. Not only will it catch the eye, but it will draw the reader in, so they consume more of your content. Got stunning professional photography? Let it shine by displaying it full screen, without the design constraints of your website’s CMS. But you don’t have to send your readers off to another site. Like a blog, you can host an interactive magazine on your server, with a URL that matches your website. You don’t need to worry about sending traffic away from your site, which can hurt your SEO, because the magazine’s already there. Like a print magazine, each issue will contain a series of related articles and features that your customers can’t resist reading. And by using a range of article styles and lengths, from bitty short reads and news stories to competitions and long-form features, you’ll keep readers interested for longer. You’ll draw them in, because they won’t want to miss what’s on the next page. A series of long articles will mean people switch off, or not read to the end, while a series of short articles won’t give your readers enough to engage with. You can also include calls to action and links throughout your magazine, drawing your readers to the next article, or to the e-commerce sections of your website. While you can add links and calls to action to your blogs, they tend to be more fragmentary. The only thread between posts tends to be the time they were published, or tags, which can frustrate visitors who want the most recent, relevant content in one place. Blogs, as you know, live on the web, which makes them difficult to read when you’re offline. And while you think that rarely happens in this day and age, it does. How often have you wanted something to read on a plane but had no connectivity? Or been in the deepest darkest depths of the countryside without 3G? Because interactive magazines are downloadable, customers can take you with them anywhere, even offline. By being available when the internet isn’t, you’ll have a captive audience, looking for entertainment and information. You’ll become their go-to publication on future trips. Each magazine can feature a variety of interactive elements, from videos, to competitions and forms. That means you’ll have lots of ways to keep readers interested in your content. In fact, more than eight pages are read, on average, per magazine. The average magazine dwell time magazine is 3.24 minutes, while the number of return visits is at 28%. Like a blog, every page is measurable. You can use Google Analytics to see what your audience is interested in and tailor future content accordingly. You could choose to include full-page advertising as an additional source of revenue. By featuring ads from carefully selected partners, you’ll compliment your content and add value. And the beauty of it is, advertisers can send over artwork that’s ready to slot into your page. You just need to give them the relevant dimension. They could even boost their own engagement by including video and sign-up forms. If you’re concerned about ad blocking amongst your audience you could include sponsored content, or advertorials. These articles, written by your advertisers, will offer your readers editorialised information about complimentary products and services in a way that keeps them interested. We all know ‘personalisation’ has been the marketing buzzword of 2015, and interactive magazines can help you take advantage of that trend in a way that a blog can’t. You can address your readers by name, so it feels like the publication was crafted just for them. Or you could go a step further. You could choose to only display content that you know they’re interested in. For instance, if you know a segment of your magazine’s readers only want to know about womenswear, you might choose to only display that content. By tailoring content to your reader’s interests, you increase the chances of them reading every page. There are so many ways that interactive magazines can be used, it’s little wonder that interest in them will continue to grow in 2016. As marketers and brands look to present their content in an innovative (and measurable) format, they will be used to present editorialised copy alongside blog posts, to increase opportunities for engagement. 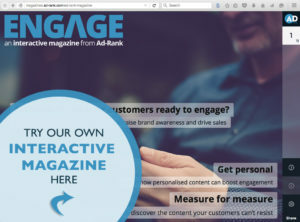 To find out more about interactive magazines and what they can do for your brand, read Engage magazine today.